The Breeders’ Cup took important steps last week to help ensure the integrity of its races, while at the same time prodding those states not already on board to hurry and establish steroid policies for tracks its racing authority regulates. Should a horse test positive for anabolic steroids at the Oct. 24-25 Breeders’ Cup World Championships at Santa Anita, the trainer of that horse will be suspended from the event for one year. The organization also instituted a “three strikes” rule that would ban a trainer from Breeders’ Cup races for life should horses in his care violate the steroids policy three times. Perhaps more importantly, beginning Jan. 1, 2009, Breeders’ Cup will not help fund purses or hold Breeders’ Cup “Win and You’re In” races at tracks that are not following the model rules for steroid use established by the Racing Commissioners International. With calls for uniform medication rules within the industry for decades, Breeders’ Cup officials are helping move racing in that direction. While it is important for policies to be uniform from state to state, it is also necessary for the rules and regulations to be the same for claiming horses as they are for grade I horses. But headlines are made by “big” races and “name” horses, so the Breeders’ Cup forcing the issue is the right thing at the right time. In this instance, the big race was the Kentucky Derby Presented by Yum! Brands (gr. I) and the big horse was Eight Belles, whose breakdown while galloping out after finishing second on racing’s biggest stage made the type of headlines the sport was not looking for. But, in fact, her tragic death has become a rallying cry for an industry often criticized for holding many meetings but accomplishing little. Many positive decisions have been made to help right the plight of the Thoroughbred since the death of Eight Belles. Organizations such as the Breeders’ Cup have gotten the message that the time is right for not only urgent, but clear, decisive, and strong action. In the release announcing its new policies, Breeders’ Cup chairman Bill Farish said the organization’s board believed it was crucial to take a leadership role in ridding anabolic steroids from the sport. He is correct. In fact, it has a responsibility to lead the sport into new territory, and based on its new policies, it is taking that duty seriously. The Breeders’ Cup’s hard line on steroids is one of several firsts currently happening in the industry. Thoroughbred auctions at Fasig-Tipton and Keeneland are being conducted this summer and fall under new conditions of sale, prompted by recommendations from the Sales Integrity Task Force. 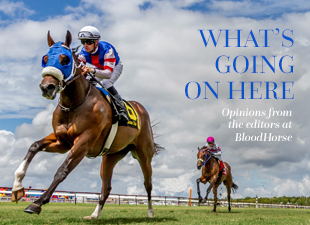 Like the Breeders’ Cup has said it is watching trainers and veterinarians, the Task Force is watching breeders, consignors, buyers, and agents. It has taken some steps to help ensure the integrity of the Thoroughbred auction place, while realizing it has taken only the first steps in that process. A monitoring committee has been established by the Task Force, with Fasig-Tipton chairman and former Breeders’ Cup head D.G. Van Clief Jr. as its leader. It is not easy to reach a consensus when self-regulating, but Van Clief ensures integrity in the process. Other important matters, such as the disclosure of surgeries of young horses before they are sold, are being discussed by the members of the group. In New York, the first $100,000 allowance race was run at Saratoga after the New York Racing Association instituted a new policy adding purse money to distance races (nine furlongs or more) with more than six (dirt) or eight (turf) starters. The idea, conceived by NYRA chairman Steve Duncker and refined by racing secretary P.J. Campo, is a great step in promoting durability in the breed.